Sites like YouTube and Vimeo have transformed the way the average internet user finds information and communicates with other people. Many of the world's largest and most successful companies have recognised this shift and are developing ways to create a YouTube-like experience for their workforce. But YouTube-level capabilities alone will not cut it. For enterprises to truly take advantage of video as a means for communication, collaboration, and knowledge transfer within their organisation, they need an enterprise video platform with a high degree of functionality that goes well beyond what public video sites like YouTube and Vimeo can provide. Many of the most successful businesses have already integrated their various content silos into a central portal to simplify knowledge transfer. While YouTube may work through these portals via tedious copying and pasting links, an enterprise video platform will integrate with an organisation's existing social business portal to make video adoption seamless. On a public site like YouTube, sharing is simple. The unfortunate side effect of this simplicity is that it is difficult to control who can and cannot see your content. 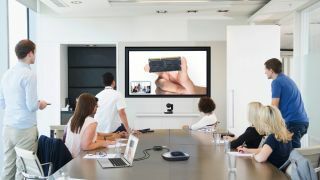 Corporate video communications often need to communicate sensitive, valuable information to a select group, internally, without the risk of that information leaking. An enterprise video platform provides content owners and managers with a high degree of control over video access through encryption, login security measures and Digital Rights Management. YouTube is built to provide hundreds of thousands of concurrent streams to users around the world. Even the world's largest organisations do not have the network capacity to devote that amount of bandwidth to video, even when it is important that a message reaches a wide internal audience all at the same time. Enterprise video portals optimise network infrastructure with technology like intelligent content routing and video network edge devices that dramatically reduce the volume of video bandwidth required to stream videos to a wide variety of devices on the network. Providing the right content to the right people can be a hassle in the freeform organisation of YouTube-style video interfaces. An enterprise video portal offers sophisticated content management and organisational tools like featured videos and channels that let you control the way your video information is presented to employees. Videos like executive webcasts and training channels need to be highly organised for maximum impact in a way that YouTube's open environment cannot provide. Managers can also create custom skins for their corporate video portal to conform to brand guidelines and highlight the most important videos to the organisation. Finding the right video on YouTube can be difficult. With inconsistent metadata and unsophisticated search algorithms, getting the information you need on YouTube can be a frustrating process. An enterprise video solution should employ targeted search algorithms as well as Speech Search which allows users to search through the audio tracks of every video on the platform, reducing search inconsistencies and metadata errors. This will reduce the time it takes for employees to not only reach the specific video they are looking for, but it also enables them to search for keywords within the video itself so they can pinpoint the precise section of the clip containing the information they need. YouTube has taken video to the next level of daily communication and knowledge sharing. An enterprise video platform allows your business to expand upon those features and deliver a holistic, seamlessly integrated video experience to your employees, globally. When it comes to enterprise video communication, YouTube is not enough, but an enterprise video platform may just be the beginning. Martin Nurser is Vice President of Qumu EMEA. He brings more than 25 years of enterprise and technology industry experience with emphasis on engineered systems and cloud technologies. He is a leading expert in channel and strategic alliance development and management, go-to-market planning, as well as market segmentation and business strategy formulation.